As the oldest and one of the most respected Catholic schools for boys in California, Loyola High School of Los Angeles has a well-established legacy of excellence on and off the sports fields. 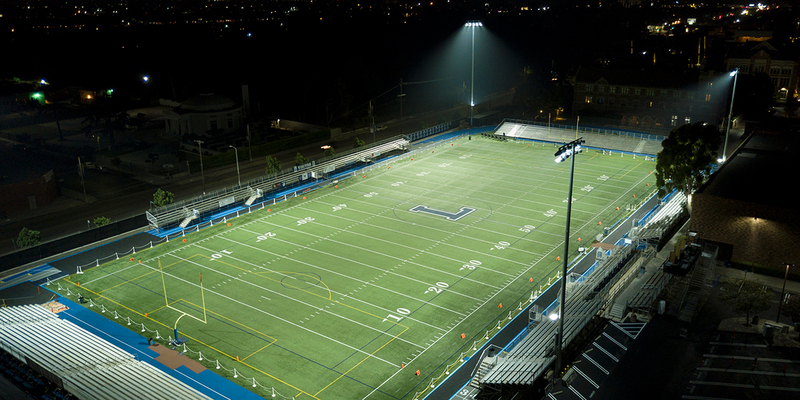 But for years, whenever Loyola hosted a night football game, it was forced to bring in temporary, mobile lighting cranes to light the field. Not only was the temporary lighting expensive, inefficient, and a source of glare and light spill in the adjacent residential area, but the school also had to have a portion of Venice Blvd.—a major L.A. thoroughfare—shut down during night games to accommodate the cranes. Total Light Control – the system’s patented optics and glare control technology applies high-quality lighting onto the field, without glare or spill impacting the homes of nearby residents. Improved Visibility – quality of the on-field lighting has been greatly improved, with superior uniformity and a glare-free experience for players and spectators. Energy Efficient – the new lights reduce CO2 emissions by 618 metric tons compared to typical metal halide equipment, which is the equivalent of removing 130 cars from the road for one year. Cost Effective – Loyola will realize a savings of more than $198,000 over the next 25 years compared to typical metal halide lighting. Additionally, with Musco’s long-term parts and labor warranty backed by a team of technicians, school leaders and staff won’t have to worry about handling maintenance, or paying for it, for 25 years.